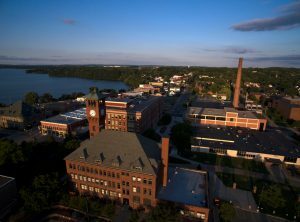 Aerial photos of campus are taken with a drone, or unmanned aerial vehicle (UAV), by Swift Aero Thursday, August 25, 2016. The conference will feature student and faculty presentations, roundtables, and poster sessions. There will also be opportunities for social interaction and networking with other Honors students, faculty, and staff from across the region. For more information about the conference, including registration and proposal submission forms, visit the UW-Stout conference website. Dues notices for the 2018-2019 year have been sent out. Contact the UMRHC office if your school is not listed as a member institution. The UMRHC website is looking to update honors programs’ social media activity. If your program has a facebook page or twitter account, let us know! The 2018 National Collegiate Honors Conference will be held November 7-11, 2018 in Boston, MA! For more information, please visit the NCHC’s website.